The mission to brew ten red beers to mark ten years of Red Hill Brewery is entering the home straight. This time around, it's another beer inspired by the classic brews of Europe in the form of an Irish red ale. 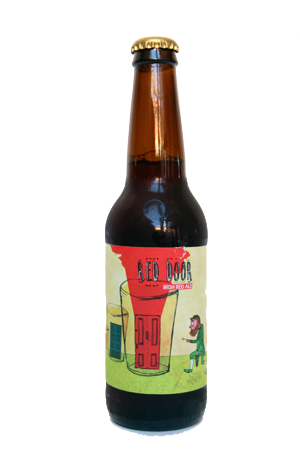 Red Door is beer number seven and takes its name from the famous painted doors of Dublin, which according to the brewers "were said to have began when an eccentric writer painted his door bright red so his neighbour wouldn’t mistake it for his own on his way home from the pub". Seems a perfectly reasonable idea. The beer itself is of an orange-red hue and, to our tastes, sits somewhere between the English bitters that initially set Karen and Dave Golding on the path to becoming brewery owners rather than smack bang in the middle of the often sweeter, maltier, darker Irish reds a handful of Aussie brewers make. There's a floral character to the aroma, with caramel malts dominating on the palate. NB: It was pouring "as God intended" on the handpump at the brewery but the beer slipped through the net a while here at Crafty Towers so that opportunity has passed. Sorry!